Diamond Point homes in North Las Vegas real estate by Lennar features large and pool sized backyards from 6,000 to 10,000 square feet. Both single and two story homes for sale have three to five bedrooms and up to three baths. Except for the Newport floor plan, all homes have a three car garage. The north Las Vegas homes range form 1,912 to 3,100 square feet. Included amenities are covered porch entries, media niches, designer appliances, cabinetry, plumbing fixtures, lighting fixtures and countertops. 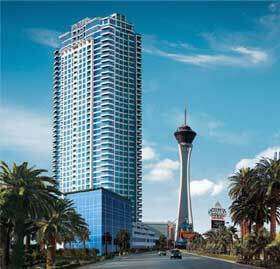 Sky Las Vegas condo tower opened several months ago and recently sold one of its unfinished penthouse unit for $2.7 million. This Sky condominium is 3,500 square feet with a 500 square foot balcony on the 42nd floor of the 44 story tower. Total remaining Sky condominiums for sale equal about 40 units. Units range from 870 square feet to 5,500 with prices from $700,000 to $5 million. The real estate also includes 702 parking spaces with 43,500 square feet of retail space. Warmington Homes in Las Vegas Nevada real estate is offering builder incentives of reduced prices, many upgrades and increased incentive levels on immediate occupancy homes in three developments within the Las Vegas Valley. A builder’s incentive of a closing cost allowance for obtaining a mortgage through the builder’s preferred mortgage broker. The Cambria condos in north Las Vegas, Mandolin two story homes at Mountains Edge real estate and Carlisle Place single story homes for sale in the southwest are participating in the incentives. Bradford and Auburn homes in Providence Las Vegas hosts movie night on July 26, 2007. This movie night will showcase the new model homes. 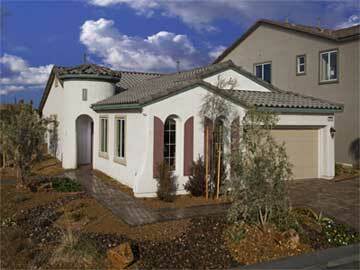 These new homes for sale are located in north Las Vegas real estate by Ryland Homes. Some features included in these north Las Vegas homes include a gated neighborhood, Merillat kitchen cabinets and Corian countertops.